A small number of Spotify Premium subscribers are reportedly seeing a notice for the new audio option, according to The Verge. The notice may be an A/B test of pricing, as screenshots of the notice display a different cost and varying benefits of signing up, and attempts to upgrade result in an error message advising it is not available in the user's area. 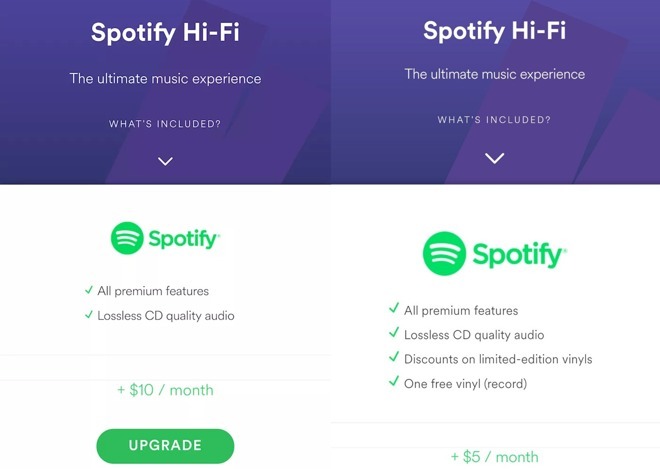 Posts on Twitter and Reddit note the upgrade price as either $5, $7.50 or $10 on top of the existing $10 Spotify Premium cost. There is also some variation in what is offered, with some users seeing just the lossless audio as an extra feature, while other benefits include a free vinyl record and discounts on limited-edition vinyl releases. Spotify confirmed the existence of the in-app prompts, but stopped short of admitting it was planning a lossless audio service. A Spotify spokesperson told the publication, "We are always testing new products and offers, but have no news to share at this time." The addition of lossless audio could give the streaming service the boost it needs to become profitable, something a board member suggested would occur sometime in 2017. Spotify has posted losses in multiple successive quarters, caused by a combination of paying for music licenses and expanding the service's reach, amassing over 40 million paid subscribers in the process. Offering higher quality streams would also put Spotify in direct competition with Tidal, a service that primarily markets itself on providing lossless audio to its users. The troubled Tidal has an extremely small user base in comparison to Spotify, with recent reports suggesting it only provided 0.1 percent of all music streams, acquiring 0.33 percent of streaming revenue. It would also give Spotify another way to differentiate itself from its main rival Apple Music, which quickly surpassed 20 million subscribers in less than 18 months. While there were rumors of a "Hi-Res Audio" streaming option for Apple Music, which would take advantage of the higher fidelity audio the Lightning port is capable of providing, Apple has yet to show signs it will implement the feature into its service.